TLV is pleased to announce the release of its new Free Float® J6S-X stainless steel (A351-CF8) steam trap. 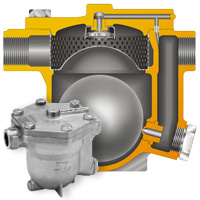 TLV Free Float® steam traps are used in a wide range of industries because of their reliability and durability. Free Float® traps feature an innovative freely moving float that regulates condensate flow without any lever. Since no levers or hinges are used, operational wear of mechanical parts is greatly reduced and product service life increases immensely. The freely-moving float moves up and down in response to the amount of condensate inflow, automatically adjusting the valve opening and continuously discharging condensate to prevent back-ups. The stainless steel construction makes the JS-X series ideal for use in the food and chemical industries, as well as any other industry requiring durable stainless steel traps. The built-in X-element improves process heating efficiency by automatically venting out air at start-up and throughout regular operation.